The Mozart lovers, who know the true story, the very neighbors in the third district and the gloomy city tourists may know about this spot in Vienna. But even some of my Viennese friends have never seen or heard about St Marx cemetery. 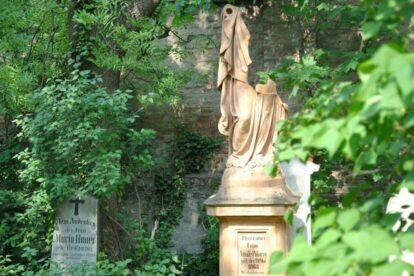 Vienna is known as a place for morbid melancholy, so what else should be suitable as to visit a very small and hidden Biedermeier cemetery which was a burial site for about 90 years until 1874. This cemetery is the place where once poor Mozart was thrown into a mass grave (so it’s said) as there was no money to pay for a proper funeral. But you are not here to visit the vanished mass graves of former times but this neat and peaceful park-like place, with small paths, trees and shrubbery. You will find amazing weather-beaten tombstones, sculptures fallen to bits and pieces, epigrams worn off by the ravages of time. This is a beautiful, quiet spot for a stroll (though the close highway overpass is weird), especially in summer time. In autumn all trees turn golden and red. Spring is great as you find hundreds of lilac bushes! But also on a snowy winter day you can relax from the hustle and bustle of town.